But why did Moses believe that the incense was the cure for the plague? Why didn’t he just pray for them like he did after the sin of the Golden Calf? Why was incense the prescription for this particular sin and how did Moses know that the incense would deliver them from death? Rashi proposes that the Children of Israel had come to view the holy incense as a dangerous poison, since it had initially killed Nadab and Abihu, and now had killed the 250 associates of Korach who had attempted to offer it. Maybe Moses used the incense to show that it was a source of life, rather than death, and that “incense does not kill. Sin kills” (b.Shabbat 33a). Another opinion from the Talmud (b.Shabbat 89a) is that when Moses was given the Torah on Sinai, he was also given a special gift by the Angel of Death, as it says, “You have ascended on high, you have led captive your captives; you have received gifts among men, even among the rebellious also, that the LORD God may dwell there” (Psalm 68:19 , NASB). That gift he was supposed to have received from the Angel of Death was the knowledge that the holy incense of the Tabernacle brings atonement. Maybe this is why he used incense. Maybe, however, Moses used incense because it affects the only sense of our body that was not affected in the sin in Gan Eden (the Garden of Eden). How was it not affected? In the biblical account we read that Eve “listened” to the serpent, she “saw” that the fruit was good, she “touched” it, and she “tasted” it. Her sense of smell was not involved in the entire affair. It remained pure and unadulterated by sin. Therefore, the fragrances and aromas can penetrate directly to a person’s soul without the potential of being tainted. This is one reason we smell fragrant spices at the conclusion of the Shabbat. It brings comfort and refreshes our souls. When Aaron brought the holy incense to the presence of the Children of Israel, it was as if God himself were breathing into each person the breath of life. 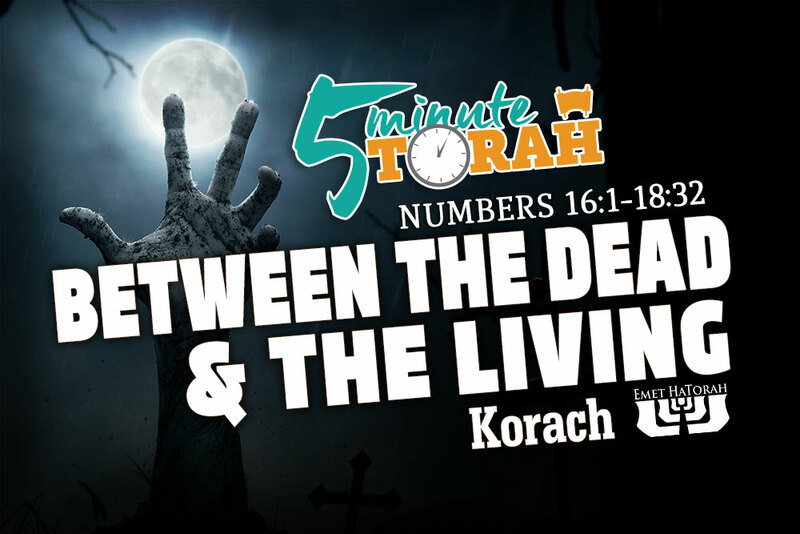 But if this is the case, then why do we read that Aaron, “stood between the dead and the living”? Why this specific language that implies Aaron did something courageous? Rashi says that as the Angel of Death went through the camp, Aaron stood his ground against him and refused him passage between those whose lives he had already taken and those whom he was pursuing. He halted the plague by boldly refusing to budge, even in the face of death. Whether fact or fiction, these legends teach us important principles. One of these is that neither Moses, nor Aaron, considered their indignation worth punishing others. In fact, Aaron was willing to go head-to-head against the Angel of Death on their behalf. As Yeshua was suffering on the cross, metaphorically standing “between the dead and the living,” he prayed for his tormentors saying, “Father, forgive them, for they know not what they do” (Luke 23:34). How do we respond when people verbally attack us or belittle us? Do we continue to love them and serve them, or do we merely want revenge? Moses and Aaron are great examples of men who care more about others than themselves, demonstrating this through their actions. Yeshua, however, is our ultimate example of this selfless love. We would do well to imitate these examples.